Over the past one week, there was a strong debate going on over Bloomberg Asia News. The foreign investors were arguing about the pros and cons, to invest either in Hong Kong or Singapore for the financial hub in Asia region. For those who followed the debate and comments about Hong Kong and Singapore from the investors, it's really surprising that both countries have their strong selling points and attractiveness to sell, which are hard to ignore. As the connection and location between Hong Kong and China is close, this has become the main point for the investors to set up business as the base office in Hong Kong. However, Singapore promotes its country as clean environment (free from pollution), cheaper property costs and lower living expenses than in Hong Kong. I think, this year's Hong Kong Chief Executive election will create a lot of news attention as the newly elected Chief Executive (will be announced on 25th March 2012) needs to work harder to win Hong Kongers' trusts in improving the living standard among the poor and middle classes as well as to control the costs of over rising property, which becomes unaffordable for the people to buy in Hong Kong. On top of that, the newly elected Chief Executive has to convince the investors about the healthy growth and stability of the country in order to keep investing in Hong Kong as the financial hub in Asia region. Similarly, it will become more interesting to watch out for the debates on how to improve the U.S. economy and poverty gap, between Democratic and Republican Parties during the U.S. Presidential Campaign 2012. Stephen Chung gave up on buying an apartment in Hong Kong after realizing it would take him 10 years to save the $115,000 deposit for a two-bedroom box in the northern part of the former British colony. He isn’t expecting any help from the city’s next leader. Chung’s bitterness reflects a broader disillusionment with the city’s leadership ahead of a March 25 election, which will see a 1,193-member committee of billionaires, businessmen, lawmakers and academics choose a new chief executive for the next five years. While China’s tacit approval is seen as necessary to win, the campaign -- with two candidates dogged by personal scandal and conflict of interest allegations -- has exacerbated public discontent over collusion between business and politics and fueled accusations that leaders are out of touch with regular people. The new chief executive will inherit a city with the biggest wealth gap in Asia, which has been spawned by an influx of money from mainland China and eight years of rising property prices that have made Hong Kong the world’s most expensive place to buy a home. At stake is the city’s ability to maintain its status as the best place to do business and as a gateway to the world’s fastest-growing region, as the new leader tries to balance China’s demands for stability with the aspirations of Hong Kong’s 7.1 million residents. While the economy has grown 62 percent since the handover of British rule in 1997, median monthly household incomeremained unchanged at HK$20,000 ($2,576). London-based Savills Plc (SVS) said the price of an apartment in Hong Kong is almost two times higher than in London, which placed second on the property broker’s list of most expensive places to buy a home. Even though most Hong Kong residents won’t get to choose the next leader until universal suffrage is introduced in 2017, the candidates have directed their campaign messages at the issues that most irk them. Henry Tang, the city’s former chief secretary, said in a March 8 interview he will expand public housing by a further 60 percent in five years, spend HK$6 billion more annually on schools, and create 100,000 jobs for the middle class if he wins. The election pits Tang, the son of a textile tycoon, against Leung Chun-ying, the son of a policeman and the popular choice in opinion polls. Democratic Party lawmaker Albert Ho is also running. The University of Hong Kong is running an alternative poll, allowing all residents to cast votes in a mock election by smartphone, at polling booths and online. The project’s computer server crashed at around 7 a.m. today in a second suspected cyber-attack, said Joyce Chan, a research executive at the university project. Two days ago, the site experienced a million hits a second, overloading the computer system. “We are encouraging people to use the polling booths, which are not affected,” Chan said. Leung, 57, was backed by 43 percent of respondents in a poll of 957 people published March 16 by the Chinese University of Hong Kong. Tang got 18 percent support. Two-thirds of the respondents in a Feb. 23 poll published by the South China Morning Post said Tang should quit the race after he admitted to knowledge of a basement built illegally by his wife. China, which is undergoing its own leadership transition later this year, hasn’t formally indicated its preference. Its rulers, who have their own leadership troubles with the ouster of Chongqing party chief Bo Xilai last week, have signaled concern over the prospect of growing unrest in Hong Kong. Thousands took to the streets March 3 to demand that current Chief Executive Donald Tsang resign after it emerged he had taken trips on yachts and planes of his tycoon friends. Former Chief Executive Tung Chee-hwa resigned after half a million people protested in 2003 against a proposed anti-subversion law they feared would curtail personal freedoms. Leung may have won the backing of China. Officials at Beijing’s Liaison Office in Hong Kong have been calling committee members to encourage them to vote for Leung, the city’s public radio station RTHK reported March 20, citing James Tien, the honorary chairman of the Liberal Party. Liu Yandong, a member of China’s Politburo, has met Hong Kong businessmen to persuade them to vote for Leung, the local Sing Tao Daily reported the same day, without citing anyone. Leung has pledged to build more public housing, increase land supply and provide tax-breaks to help residents buy their own homes. He also promised to speed up public projects like expanding the city railway system and encourage the use of electric and hybrid cars. Leung has not been free of scandal. The city’s Legislative Council is investigating claims he had a conflict of interest in helping select an arts hub in the city in 2002. Leung, a former adviser to chief executives Tsang and Tung, has denied any wrongdoing. The city’s next leader, who takes office July 1, will have to navigate growing tensions between Hong Kong residents and mainland Chinese. Tour operator Chung embodies the ambivalence of his fellow Hong Kongers: While some of the customers who buy his Secret Hong Kong packages are mainland Chinese, he blames the influx of money from the mainland for pushing up property prices and forcing him to put his plan to buy a 600-square-foot apartment on hold. The tensions have spilled into the open. An advertisement placed Feb. 1 in the local Apple Daily newspaper, controlled by Hong Kong media tycoon Jimmy Lai, portrayed mainland Chinese mothers who entered Hong Kong to give birth in local hospitals as locusts for sucking up the city’s resources. The number of births in the city almost doubled in the decade to 2010, thanks to 232,536 babies born to mainland mothers, according to the city’s Census and Statistics Department. Kong Qingdong, a professor at Peking University, called Hong Kong residents “dogs” on a television talk-show, in reference to the city’s colonial history and the use of Cantonese, instead of Mandarin, by its residents. The economic pressures buffeting Hong Kong’s leaders echo those across the region, where voters elected an opposition party in Thailand that gets its support from the nation’s poor and in Singapore where the ruling party last year won its smallest majority since independence in 1965. Hong Kong has limited tools to rein in inflation, which averaged 5.3 percent last year and has hurt the poor. With the local currency pegged to the dollar, the city takes its cue on monetary policy from the U.S. Federal Reserve, which has keptinterest rates at close to zero since December 2008. Tang said in the March 8 interview that it wasn’t in the interest of Hong Kong to depeg from the U.S. currency. Closer ties with China have been a mainstay of Tsang’s policies, as he pushed for a 72.9 billion yuan ($11.5 billion) bridge to the mainland and Macau, and encouraged Hong Kong to become the country’s offshore yuan center. Still, the city’s economy was surpassed in size last year for a second year by Singapore, which competes with Hong Kong for financial talent. A deterrent for executives considering a move to Hong Kong is the city’s pollution levels, which causes more than 3,000 premature deaths a year, according to Civic Exchange. The research group said in a statement on Jan. 12 that 49.26 million doctor visits “can be attributed to Hong Kong’s persistently poor air quality” during Tsang’s term of office from 2005. Hong Kong’s low corporate tax rate of 16.5 percent, compared with the U.S.’s 35 percent, is one of the sweeteners that have attracted international firms and helped ensure that 15 years after its return to China the city has retained its status as a financial hub. HSBC Holdings Plc (HSBA) is one of the financial titans listed on its stock exchange and Gap Inc. (GPS) is among global retail outlets attracted by Chinese visitors to Hong Kong. Data compiled by Bloomberg show Hong Kong’s free-market policies and low corporate taxes make it the best place to do business. The city, which serves as the main gateway to China, placed top in the Bloomberg Rankings index based on six factors, including the degree of economic integration and the costs of setting up business. The Netherlands, the U.S., the U.K. andAustralia occupied the next four slots. Chung isn’t convinced of the advantages of growing mainland influence on Hong Kong’s economy. It doesn’t matter who gets elected because not much will change, he said. “The problem lies in the system, the system that relies too much on the mainland,” he said. 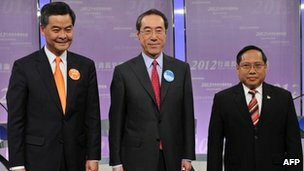 Leung Chun-ying is seen as the preferred choice in a poll that involves a small number of successful business leaders. An election committee of 1,200 Hong Kong notables is voting on Sunday for the city's next leader, as pro-democracy activists rallied outside, in the hardest fought election since the handover to Chinese rule. Leaders of the regional financial hub's business, labour and political communities convened the 1,200-member election committee that is responsible for selecting a replacement for outgoing Chief Executive Donald Tsang. The vast majority of Hong Kong's seven million residents have no right to vote in the "small circle" poll, according to the One Country, Two Systems arrangement by which China has ruled the former British colony since 1997. Hundreds of pro-democracy activists packed the streets around the harbourside convention centre where the committee meeting was taking place, shouting slogans demanding "direct elections". Former government adviser Leung Chun-ying, 57, is tipped to win an overall majority after his campaign was boosted by the last-minute support of the city's biggest pro-Beijing party. His main rival, former businessman Henry Tang, 59, on Saturday dismissed reports that he was considering bowing out of the race. Initially seen as Beijing's preferred choice for the job, his gaffe-ridden campaign disappointed his backers among the city's powerful tycoons and saw his public approval ratings plunge below 20 percent. Polling opened at 9am (0100 GMT) and results are expected around 12.30pm (0430 GMT), officials said. Election committee members, which include Asia's richest man Li Ka-shing who backs Tang, will cast their vote through paper ballots. A second vote will be held later on Sunday if the first fails to produce a clear winner. If that fails, a fresh election will be scheduled for May. In an airy auditorium at Fung Kai Number One Secondary School in Hong Kong, about 900 students sat and listened as one of their teachers gave them a civics lesson. The right to select their next leader is a key part of citizenship, they heard, as photos were shown of the three men running to become the city's next chief executive. After the lecture, the students returned to their classrooms, where everyone took turns using computers to cast votes for the three candidates - Henry Tang, CY Leung or Albert Ho - as part of a city-wide mock election. Hong Kong residents do not yet have the right to directly select their top official, but the desire for universal suffrage is strong, according to students and teachers at Fung Kai, one of the biggest schools in Hong Kong. Eunice Leung, 16, is sharply critical of the current system, in which fewer than 1,200 electors largely loyal to Beijing will choose the Chinese city's top official on 25 March. "They are given the right to choose the chief executive, but the decision they are going to make cannot represent all Hong Kong people. That's why it is a very unfair election," she said, after casting her vote. Though it was meant to be a secret ballot, Ms Leung revealed she voted for Mr Ho, chairman of the Democratic Party, whose main platform is universal suffrage. Because of his outspoken pro-democracy stance, Mr Ho is widely seen as being unacceptable to Beijing. His two rivals are more familiar to the establishment. Among them was the right to elect the chief executive, a position roughly equivalent to mayor of Hong Kong, China's most international city and a global financial powerhouse. Robert Chung, an influential pollster who organised the city-wide popular vote, said the desire for universal suffrage has been whipped up even more by a series of embarrassing scandals revealed during two months of campaigning. "As it turns out, the election is getting more and more exciting. The candidates themselves are really trying to face the general public to gain support," he said. Even though the candidates are not elected directly, they must win some level of popular support. Otherwise, people may take to the streets to protest against a deeply disliked leader foisted on them, as they did in 2003, creating a crisis for Beijing. While Hong Kong may lack some of the rights and institutions guaranteed in a democratic system, it does have a lively, free-wheeling press as competitive as any in the West. In February, an enterprising Chinese-language newspaper published what it said were details of an enormous and illegal luxury basement belonging to the family of Henry Tang, one of the three contenders. The news eventually set off a media frenzy, rare even for Hong Kong. The candidate denied the accusations for days before finally confessing in an emotional press conference, where he blamed his wife. "I apologise to the people of Hong Kong," the then-frontrunner said, adding he hoped the public would give him another chance. Mr Tang, who had trailed the more populist Mr Leung in opinion polls, saw his public approval ratings sink further. While "basement-gate" was probably the most memorable scandal uncovered by the media, Mr Leung has also been targeted. Newspapers reported that some of his aides had attended a dinner in which a well-known gangster was present, leading to charges of triad involvement in politics. Mr Leung has denied those charges. What was meant to be a carefully choreographed leadership race has been upended by Hong Kong media. The outcome of Sunday's election appears uncertain. Some lawmakers have said that Beijing is now actively lobbying for the relatively more popular Mr Leung instead of Mr Tang, the previous favourite. But election committee members have also been urged to cast blank votes to protest against the unprecedented mudslinging, amid concerns none of the three candidates are fit to run Hong Kong. Several political parties and dozens of civic groups have vowed to take to the streets on Sunday to challenge what they call a "small circle election" decided by Beijing and the tycoons loyal to China. Thousands of people are expected to take part. The students at Fung Kai secondary school follow the news with interest. Ms Leung, the 16-year-old student, said she did not trust Mr Tang and Mr Leung because of the scandals that came to light. "I think our future leader should have some important qualities. He should be honest. As you know, honesty is the best policy," she said. 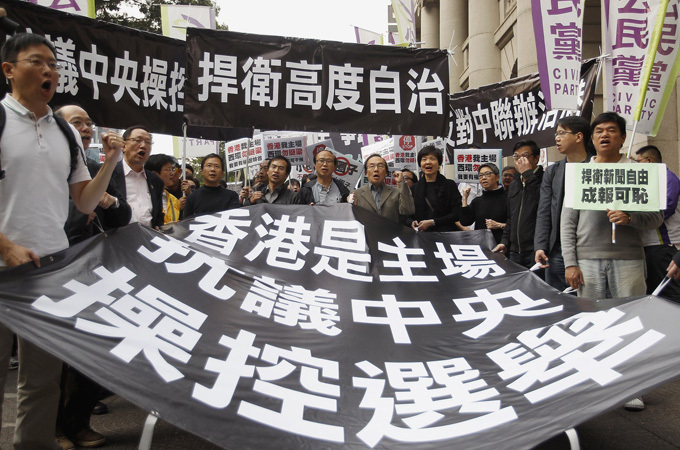 Beijing has said it may allow Hong Kong citizens to choose their chief executive in 2017. If that happens, then some of the students at Fung Kai will have the right to vote by the time they graduate.